Displaying records 1 to 20 of 304 total results. 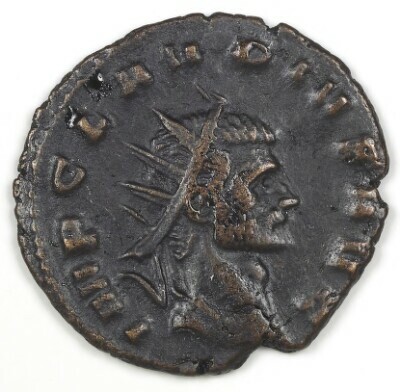 Antoninianus of Gallienus, Rome, 260-268. 1987.46.1. 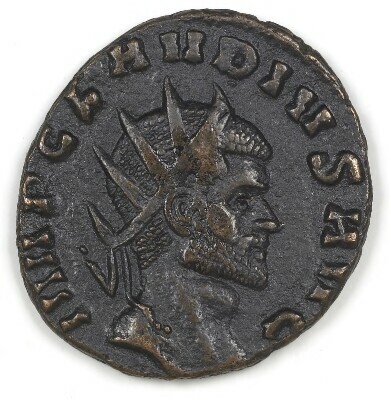 Antoninianus of Claudius II Gothicus, After A.D. 270. 1987.46.31. 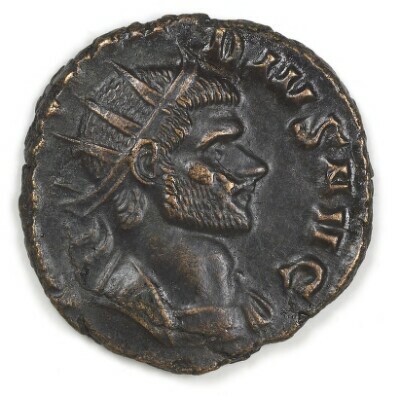 Antoninianus of Claudius II Gothicus, Rome, 268-270. 1987.46.32. 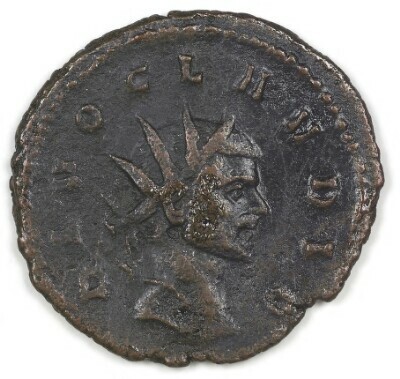 IMP(ERATOR) C(AESAR) CLAVDIVS AVG(VSTVS): Radiate head, right, draped, cuirassed. 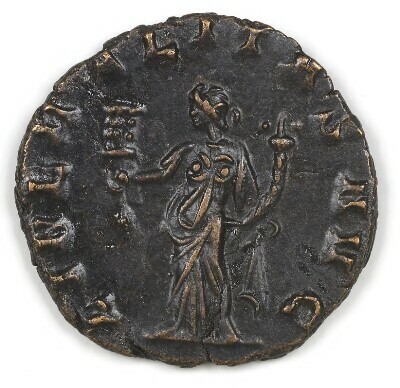 ANNONA AVG(VSTI): Annona standing left with foot on prow, holding ears of wheat in right hand and cornucopiae in left. 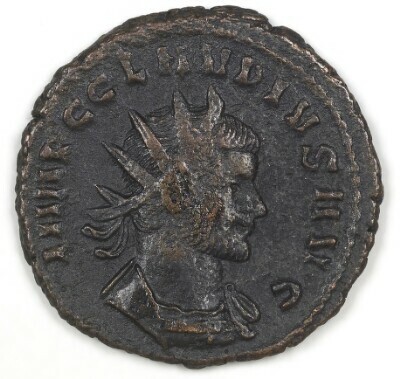 Antoninianus of Claudius II Gothicus, After A. D. 270. 1987.46.33. 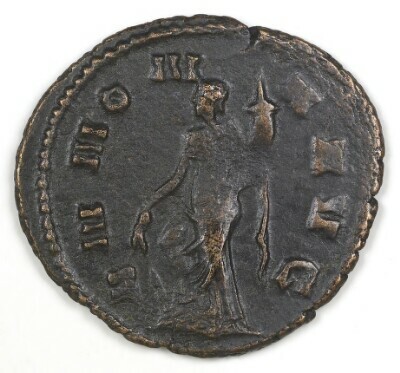 Antoninianus of Claudius II Gothicus, Rome, 268-270. 1987.46.37. 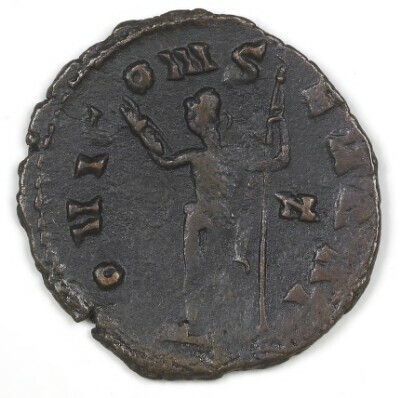 Antoninianus of Claudius II Gothicus, Rome, 268-270. 1987.46.38. 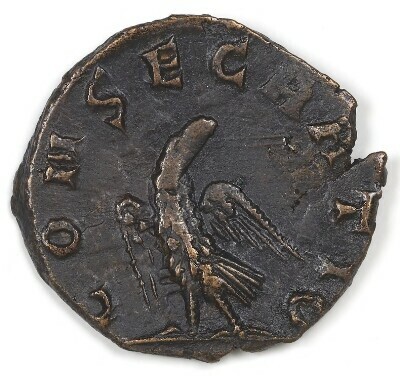 Antoninianus of Claudius II Gothicus, Rome, 268-270. 1987.46.39. 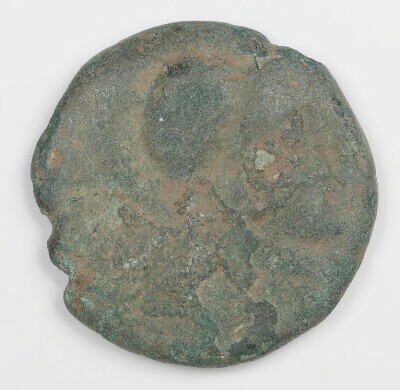 IMP(ERATOR) C(AESAR) CLAVDIVS AVG(VSTVS): Radiate head, right, draped. 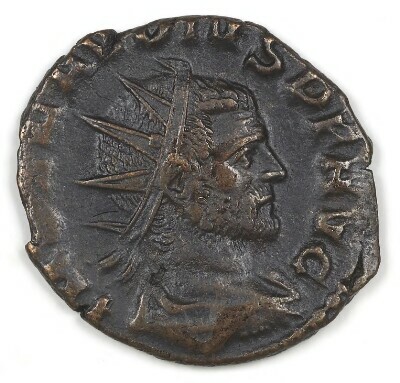 IOVI VICTORI: Jupiter standing left holding thunderbolt in right hand and sceptre in left. 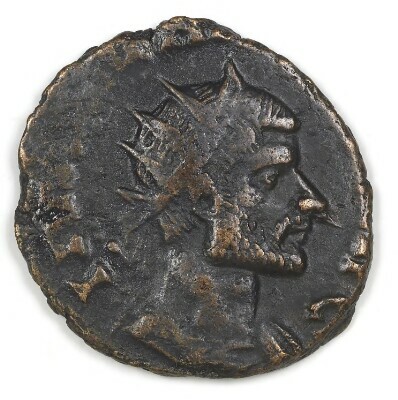 Antoninianus of Claudius II Gothicus, Rome, 268-270. 1987.46.40. 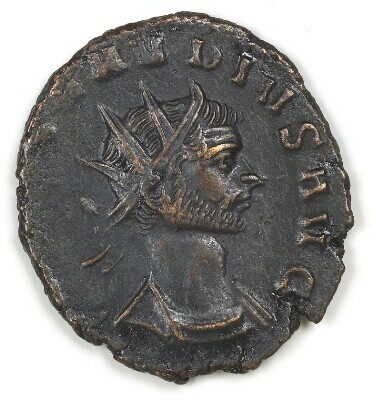 Antoninianus of Claudius II Gothicus, Rome, 268-270. 1987.46.41. 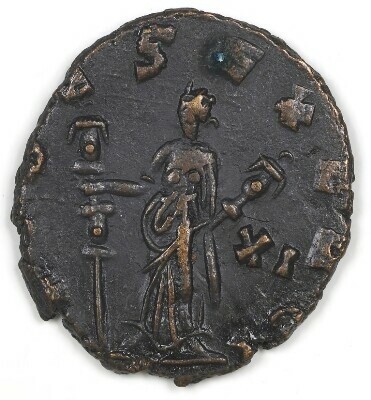 CLAVDIVS AVG(VSTVS): Radiate head, right, draped. 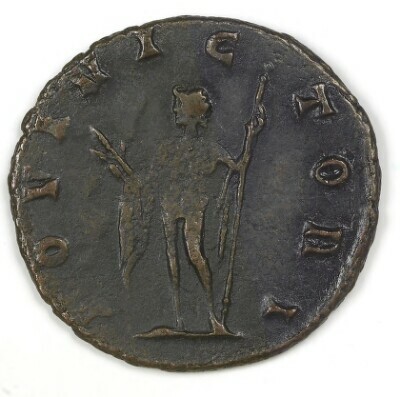 IOVI CONSERVAT(ORI): Jupiter standing left holding thunderbolt in right hand and sceptre in left. 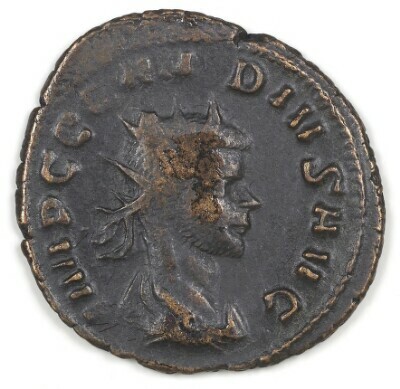 Antoninianus of Claudius II Gothicus, Rome, 268-270. 1987.46.42. 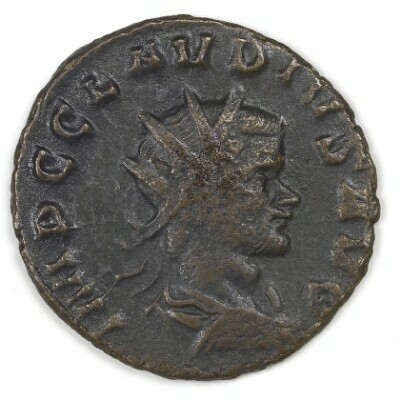 IMP(ERATOR) C(AESAR) CLAVDIVS AVG(VSTVS): Radiate head, right, cuirassed. 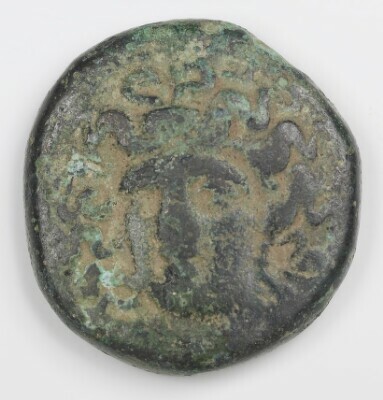 FELICITAS AVG(VSTI): Felicitas standing left holding caduceus in right hand and cornucopiae in left. 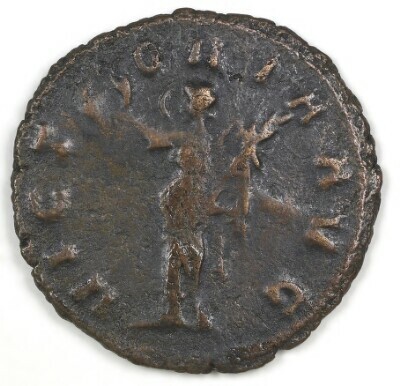 Antoninianus of Claudius II Gothicus, Rome, 268-270. 1987.46.43. 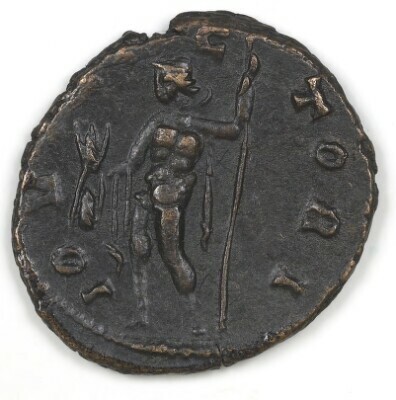 MARS VLTOR(I): Mars walking right holding spear in right hand and trophy in left. 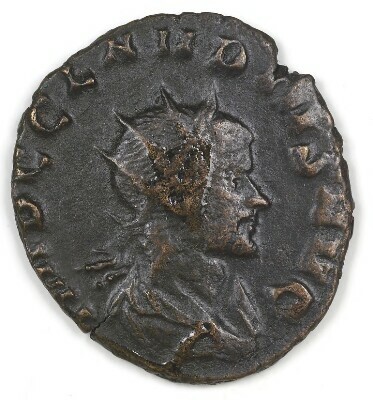 Antoninianus of Claudius II Gothicus, Rome, 268-270. 1987.46.46. 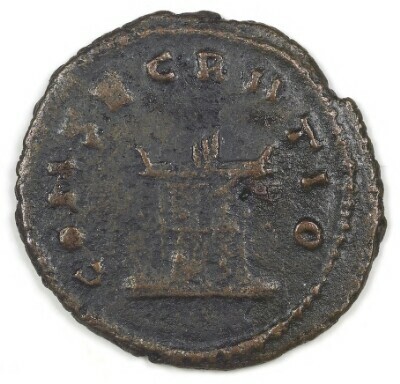 Antoninianus of Claudius II Gothicus, Rome, 268-270. 1987.46.47. 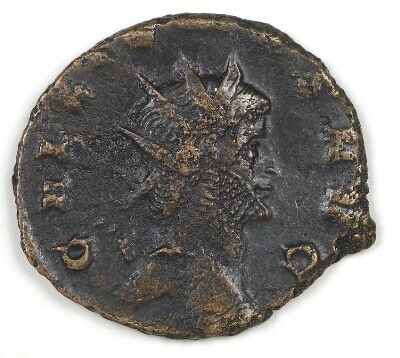 Antoninianus of Claudius II Gothicus, Rome, 268-270. 1987.46.50. 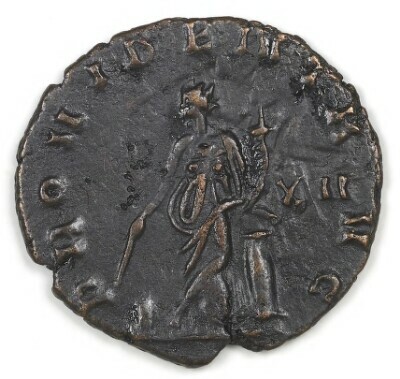 VICTORIA AVG(VSTI): Victoria standing left holding wreath in right hand and palm in left. 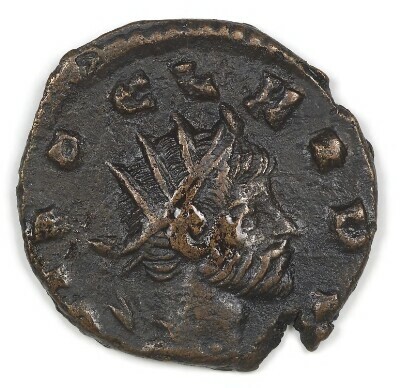 Antoninianus of Claudius II Gothicus, Rome, 268-270. 1987.46.51. IMP(ERATOR) CLAVDIVS AVG(VSTVS): Radiate head, right. 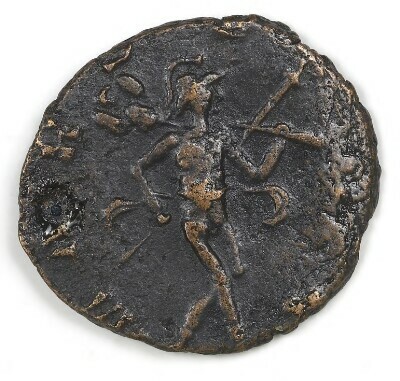 VIRTVS AVG(VSTI): Soldier standing left, right arm leaning on shield and left hand holding a spear. 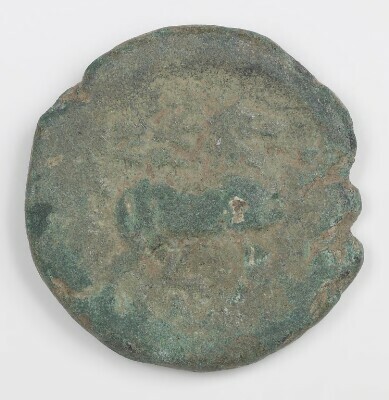 Coin of Thessalian League, Thessaly, 196 B.C.-146 B.C. 1989.12.1. 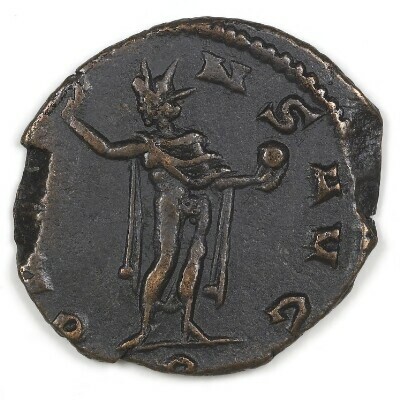 196 B.C. - 146 B.C. 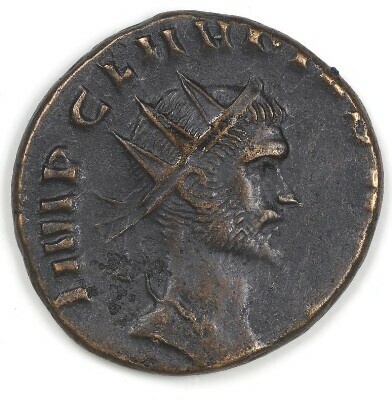 Head of Pallas right, wearing crested Corinthian helmet. ΘΕΣ ΣΑΛΩΝ: Horse trotting right. 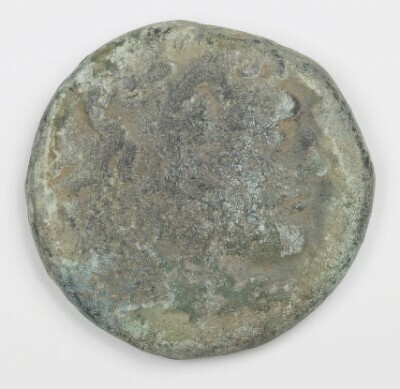 Coin, Ambracia, 238 B.C.-168 B.C. 1989.12.15. 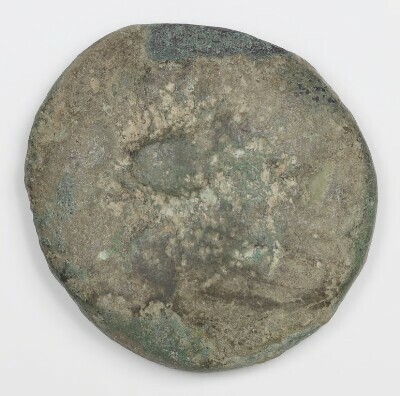 238 B.C. - 168 B.C. Head of young Herakles right, in lion's skin. Α/Μ Β/Ρ: Apollo Actius seated left; holds strung bow right. 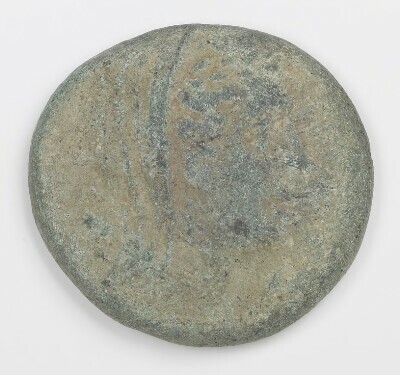 Coin of Epirote League, Epirus, 238 B.C.-168 B.C. 1989.12.16. Head of Dione right, wearing laureate stephanos and veil. ΑΠΕΙ ΡΩΤΑΝ: Tripod-lebes; all in laurel wreath. 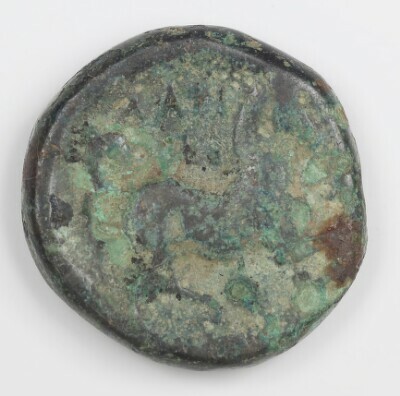 Coin, Larissa, 400 B.C.-344 B.C. 1989.12.19. 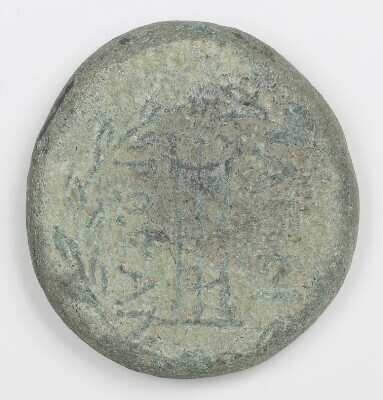 400 B.C. - 344 B.C. 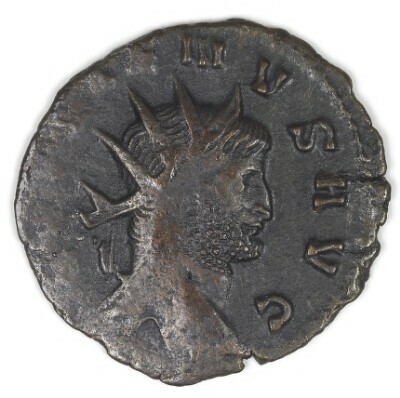 Head of Larissa , three quarter face left; hair confined by fillet, and floating loosely. 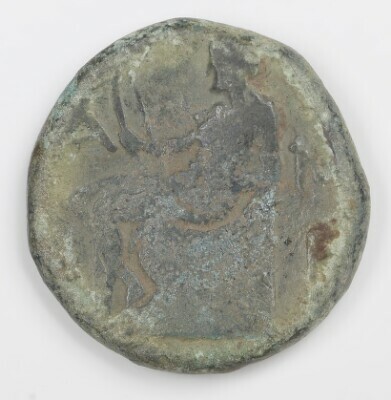 ΛΑΡΙΣͶΩΙΑ: Bridled horse right trotting. 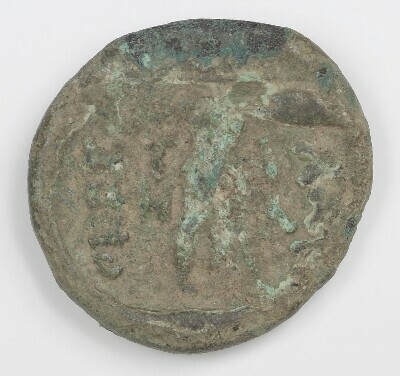 Coin of Thessalian League, Thessaly, 196 B.C.-146 B.C. 1989.12.2. Head of Apollo right, laureate. 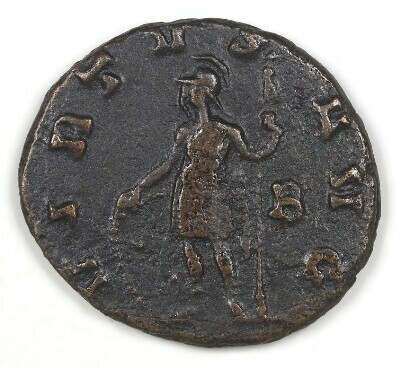 ΘΕΣΣΑ ΛΩΝ: The Thessalian Pallas Itonia fighting right.